about being crowned "New Orleans Vampire Royalty"
Q. Hi Gabrielle. Your career fascinates me. Not only are you a writer of dark delights, but you have also been crowned “New Orleans Vampire Royalty” in 2009. Can you tell us a bit about that? A.Yes, I am quite proud of that title. In 2009 the Anne Rice Vampire Lestat Fan Club invited myself and Charlaine Harris, author of the Sookie Stackhouse series that inspired “True Blood”, to be their Special Guests for the Tru Blood & Gold Ball in New Orleans. Half way through the night we were brought on stage and given sashes, tiaras and roses and given the title of “New Orleans Vampire Royalty” for our contributions to the vampire genre. It’s a great honor! Q. I also understand that you are a member of the “Vampire Court.” Can you elaborate? A. There are two main Vampire Courts in Texas—the Vampire Court of Austin and the Vampire Court of San Antonio. I am currently a member of the Vampire Court of San Antonio. A “Court” is a democratic organization designed to bring together members of the community for social events, charity events, spiritual discussions, political negotiations, etc. Q. You were closely involved with a couple of World Horror Conventions. Can you tell us what that was like? A. I was the primary graphic designer for the 2011 World Horror Convention in Austin, Texas. I designed the logo, website, and all of the accompanying promotional graphics. It was a great honor to be a part of the developmental committee for such a prestigious organization. Unfortunately I was unable to attend that one, but I did go to the following year’s WHC convention in Salt Lake City, Utah where I spoke on a few panels and did a reading from my last novel REVENGE. It’s truly an awe-inspiring gathering of some of the most brilliant minds in horror literature. I feel so very blessed to call every author there my friend and professional associate. Q. You are a writer for “Gothic Beauty” Magazine, yet your own look is more stunningly bright and beautiful instead of gothic dark. Do you feel that “goth” has been unfairly stereotyped as a dark, depressive look, or is it really a form of creative expression achieved in many different ways? A. Gothic is a mindset. And if you’ve ever met a true goth you’ll know that, while we can at times dwell in the darkness in both body and mind, we are oftentimes the most upbeat and rather silly people you’ll ever meet. Yes, “goth” is also a cultural and artistic aesthetic, which I integrate into my own world in many respects. However, as an artist I like to explore the world and all of its many colorful facets. There are days when I dress in leather and chains and corsets, and there are days when I don more colorful, yet still “gothic” ballarina dresses, etc. It’s really easier for the mainstream world to identify with the more bold and dark aspects of the goth world and, thus, that is what first comes to mind for most people on the outside. Q. Now let’s talk about your books. I have read REGRET and loved it; in fact, I reviewed it for The Horror Zine HERE. Although REGRET is about demons, don’t you normally write about vampires? A. Vampires are my first love. And they always will be. But I also have a keen fascination with the mythos behind demons and the Devil and the battle we have as humans with these creatures. Q. One of your most popular works is a series. Can you tell us about ETERNAL VIGILANCE? 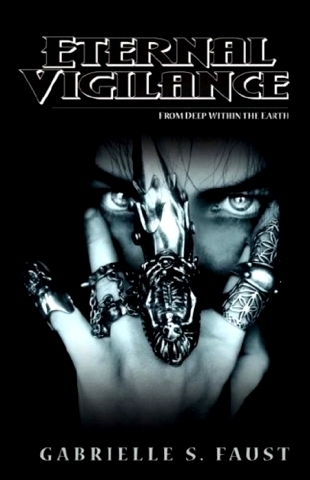 A. ETERNAL VIGILANCE is a post-apocalyptic vampire series set in the near future of 2112. It takes place after the rise of a technological dictatorship called the Tyst Empire, which wants to become immortal by resurrecting an ancient vampire god known as the Vicinus. The series is told first person from the eyes of Tynan, a Elder vampire who is drawn into the rebel uprising to take down the dictatorship and stop the resurrection. Currently there are three books in the series. I am working on the fourth, as well as the Omnibus collected edition of the first three novels. Q. What do you think about today’s popular trends for vampires and zombie in horror fiction? A. There seems to be two main camps of creativity where vampire and zombie fiction are concerned at the moment. On one hand you have people who are trying to soften the image of these supernatural creatures and make them more comedic or even cuddly. On the other hand you have authors that are bound and determined to return the creatures to their former horror glory by making them as vicious and terrifying as possible. I think both camps have their merits and as long as it keeps people interested in reading the genres, more power to them. Q. Most of my readers are writers themselves. Do you have tips or suggestions for them? A. Learn how to take constructive criticism, develop a thick skin, write the story that you want to read and not what someone else wants, keep challenging yourself, respect your editor, and, last but not least, keep writing. Acclaimed horror author Gabrielle Faust is best known for her vampire series ETERNAL VIGILANCE. 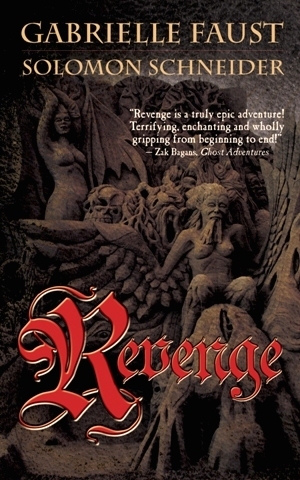 Her previous work has also included three collections of poetry, BEFORE ICARUS, AFTER ACHILLES, CROSSROADS and THE BEGINNING OF NIGHTS, the novella REGRET and the celebrated dark fantasy adventure novel REVENGE. 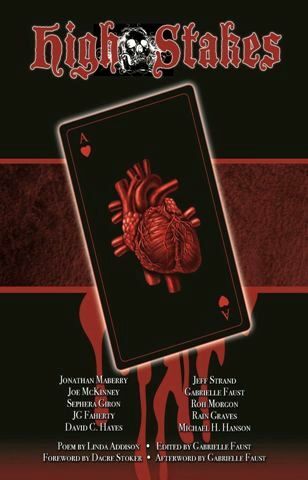 She was also the chief editor and a contributor of the vampire anthology HIGH STAKES. Her work has appeared in the sites SciFi Wire, Fatally Yours, Examiner, Doorways Magazine and Fear Zone, as well as various anthologies and magazines. She was the Guest of Honor at the Queen of the Damned Vampire Ball in 2008. In 2009 she was a Special Guest of the Endless Night Festival in New Orleans and was crowned “New Orleans Vampire Royalty” by the Vampire Lestat Fan Club at the Tru Blood & Gold vampire ball alongside Charlaine Harris. Faust is a member of the Vampire Court of San Antonio and the founder of the Nightshade Vampire Boutique. She was the primary graphic designer for the 2011 World Horror Convention and was the co-crewchief for the International Housing Program for the SXSW Music Festival from 1994 to 2010. In 2011 Faust was awarded the Texas Social Media Award by the Austin American Statesman.